So, off I go to take my practical-in-the-boat-test for the completion of my license qualification. Like the theory test, this turns out to be very different from what I had imagined. The sun is shining as I set off and I only take sun glasses with me. I stop off at the boatyard to check on the boat and find I have new neighbors. My impression of how the day would proceed was that all the candidates for the theoretical test were to be taken on a boat, shown what everything was and then taken out for a demonstration trip. 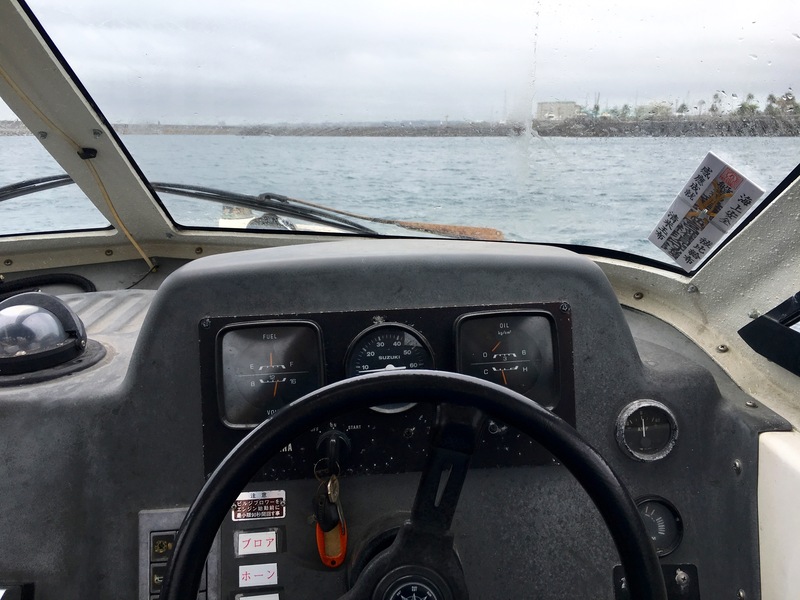 If we were lucky, we might get to steer. I show up and find an instructor waiting. I am the only student. 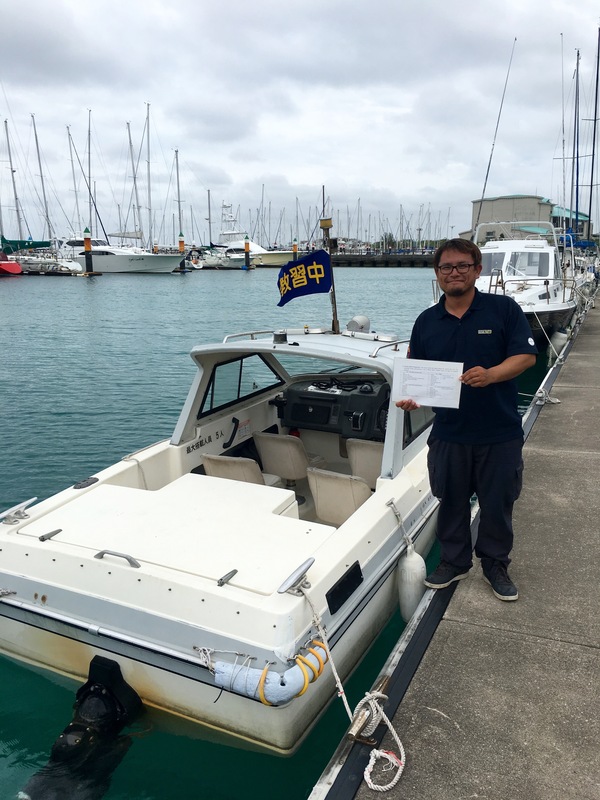 Yuta sensei beside the boat. Notice that the weather is closing in. It turns out that I am to have 4 hour training course, after which an inspector will show and I will have to demonstrate my abilities. Yuta san does not speak English but impresses on me that everything must be done by the book, otherwise the inspector will fail me. 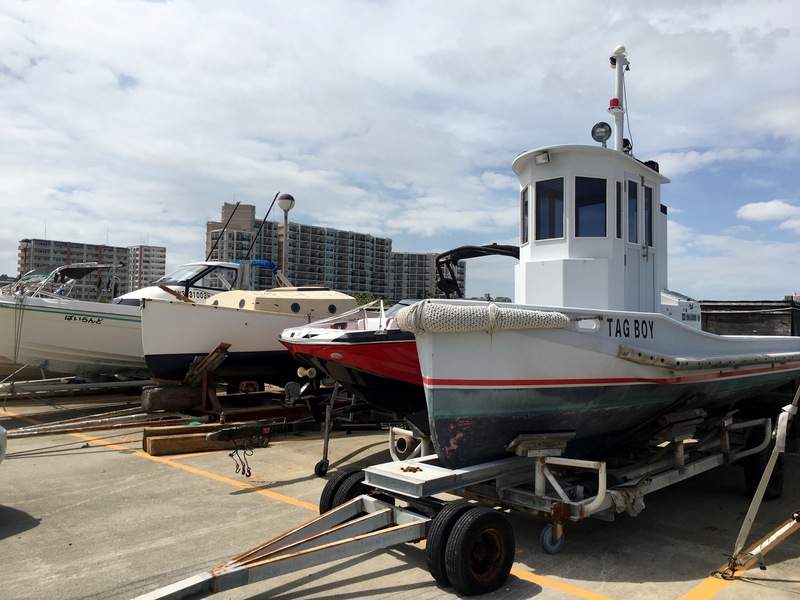 We go through, engine checks, hull inspection, safety equipment checks, navigation light checks, windscreen wiper checks, which turns out to be crucial. We then do switching on the engine, not as straightforward as you would think, warming up the engine – 10 secs exactly at 1000 rpm. We move onto knots. I have to be able to tie a bowline, a clove hitch, a sheet bend, a double sheet bend, a fisherman’s hitch, a figure of eight knot and of course a cleat hitch. Luckily Mr Pritchard taught me these when I was a Boy Scout and they are burnt into my memory. We then head out to sea. Leaving the mooring, how to untie the mooring lines , how to stow them, when to bring in the fenders, correct speed in harbor etc, etc. Each action has a precise way of doing it and failure to comply results in failure. I have never driven a speed boat before. My limited experience is on sailing boats or open boats with outboards. This thing has a steering wheel and is very powerful! By now the weather has completely changed and it is dark and pouring with rain. Yuta sensei asks if I want to continue. I assure him that this sort of weather gives me a big advantage and in Scotland it is always like this. However, as I am looking through dark glasses, it is like sailing at night! Pouring with rain. I know how to switch on the windscreen wipers. We go through changing course, slalom at high speed, man overboard procedures, picking up a mooring, navigating astern, compass bearings. Again all of these and many other techniques have to be done just right, mainly involving constantly looking around and ostentatiously checking that the control lever is in neutral whenever we stop. Back to the harbor where we practice coming alongside and correct mooring. This is not easy and Yuta san is very demanding. Anyway at 5:30 the inspector shows up. I am frankly worried as, although I know my way around boats pretty well, this is very different from remembering all the details of correct procedure. 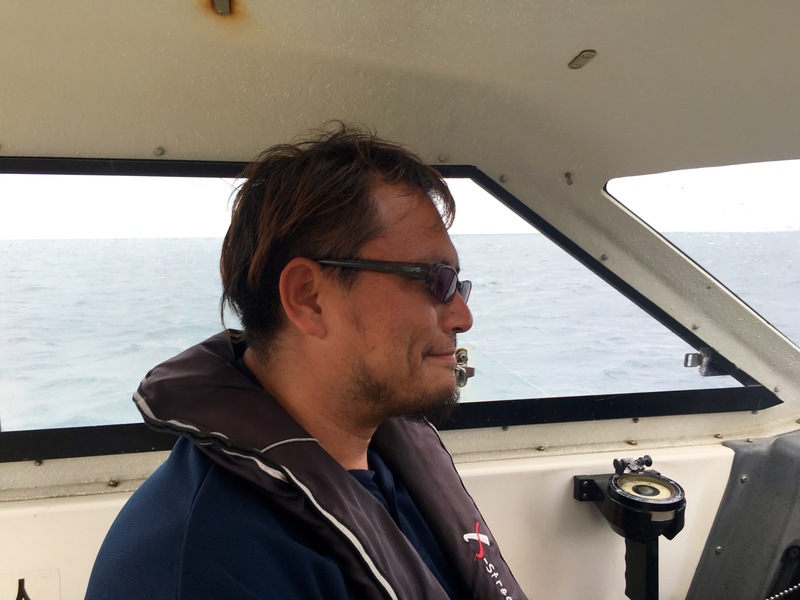 The inspector, Uehara san, is 67 years old and worked on tankers for 43 years. He is a great guy. By the time we start the test, the visibility is very bad and this unites us. We just get on with it like old sea dogs. He puts me through my routines and he tells me great stories about messing around in 300,000 ton tankers. Well gee. I guess they didn’t get my message. Brilliant! Did you pass your driving test first time? Yes but in those days it was pretty easy. For this test, the most important factor was that I had no idea what was going on.